1v1mode creature universe Mystery Gift Pokemon Tower Defense 2 story mode trading center weekly progress Weekly Progress 9/25: New Stuff! Starting locations for Creature Universe! Weekly Progress 9/25: New Stuff! Starting locations for Creature Universe! Greetings! Welcome to another amazing week of Sam and Dan games! Last week we almost completed our goal of releasing both a 1v1 level and a story level but we didn't quite make it. I did release it yesterday night which is pretty close I guess. 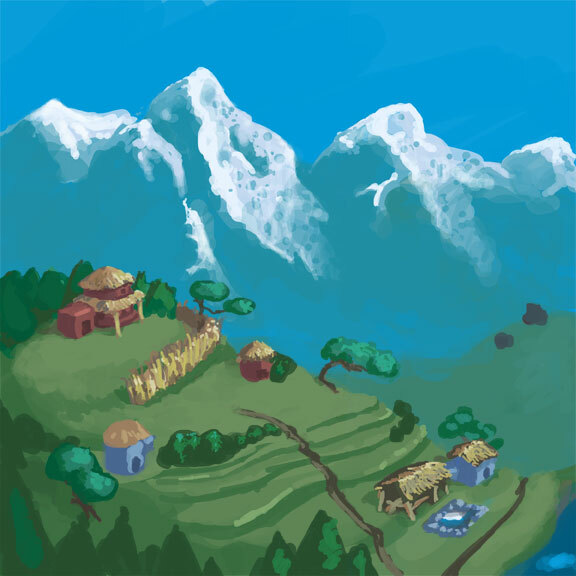 This week again we will attempt to do a Story levels among other things! We love to give you guys content and we love making it. We will also talk a little bit about the starting towns/cities/villages for the first 3 starters in Creature Universe TD. Sound good? Great! Let's get to it. This week we will finally get out of New Bark Town and into Route 29! You might have noticed that once you defeat a battle you aren't able to repeat this battle over and over like you could on PTD1. Well on Route 29 you will be able to repeat battles, catch new pokemon, hunt for shinys! I'm looking forward to making this and finally be able to see pokemon walking around in the wild instead of just having random battles. You will also get your PokePad which will act as a pokedex, a computer and it will also heal your pokemon between battles. Along with this I'll be working on getting your first party pokemon to walk behind you. If I have time I'll be adding the first Mystery Gift and the Trading Center for PTD2. Lots to do! There will be no more experience gained from defeating the enemy. You will level up by using rare candies that are given out by beating levels. When you use a checkpoint you will get the same amount of candies that you would have received if you have beaten all the way up to that point. So you can skip the previous levels and still have a powerful team. Every pokemon will now start at level 5 and evolutions will not be available for unlocking. I'm still figuring out what exactly I will do with the coins, but I have a few days to think about it. My main goal is to make it so it doesn't feel like you need to grind for the coins to be able to beat a level. So that is a little preview of what we have coming for you this week. Check out the weekly progress below to see how I'm doing during the week. I also added a new "My Status" which will tell you if I'm currently working or not. Alpha v1.191 - Bug Fix: Released! Alpha v1.19 - Route 29, PokePad, Bug Fixes: Released! Yes, Shiny Pokemon can show up in the actual battles in Route 29 but not in the map itself. Made the pokemon in your first party slot follow you in the map - Fun stuff but you won't be able to talk to it like in the other games. Added a Spawning System - This will control how many and where each pokemon spawn in a route. After closing a popup window the previous screen will now properly get back focus - When learning a new move or evolving the screen would lose focus when coming back. Not allowing you to use the keyboard shortcuts. This is now fixed. Like I've mentioned before each starting creature will have it's own starting location instead of have all 3 available in one town. What this means is that we can really do something special for the starting locations. Giving each of them their own unique style and appearance. For Creature Universe we really wanted to do something different. Instead of realistic towns that are... well kinda boring. We really wanted to do something interesting for each town. 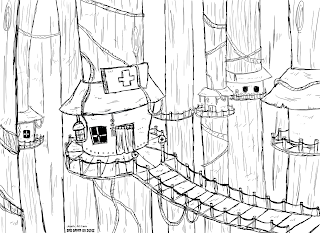 Below I will show you some sketches that our artist made to create the mood of each starting location. 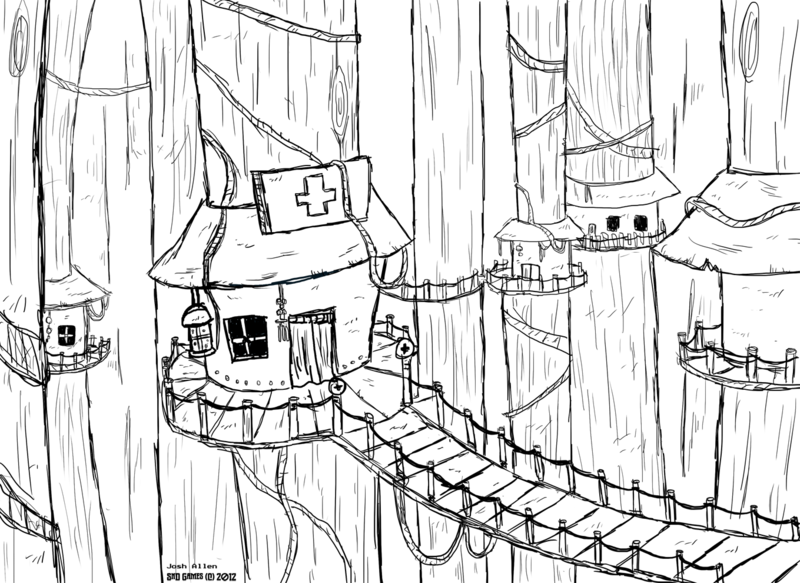 Keep in mind that these are concept sketches they don't represent the final look of the locations. Also some of these are there to strictly show an idea and not intended to look amazing. Keep that in mind! First is the grass starter zone. The grass starter is the chameleon, they mostly live on trees so why not make the town live on top of trees. Not shown in the concept is the flooding that occurs during the rainy season which is the reason they build higher up and the water that is under the trees. Then we have the fire starter zone. This place is more industrial, more gritty, it's a mining town. The fire starter zone will have a lush reservation area that the creatures live in that will be very contrasting with the rest of the zone. The fire koala family helps with refining the metals and treasures found in the mines. They also help create the steam that gives power to the town. I don't have a picture as the one I had didn't really show off the town it self but a mining cave. Lastly the water starter zone. This place is more outdoors in a place surrounded by mountains. Not shown in the concept is a zone that is dried up due to recent droughts. This zone will be divided between a rich part and a poor part. The water buffalo need water to use water so even with them around they don't completely solve the drought problem as they can only use water in their supply to defend themselves and keep themselves hydrated while doing work like pushing carts and what not. So there you have it! Three different concepts for the starting locations. Remember these were just for ideas and should give you a little sense of what each location will be like. That is all we have for you this week. As always let us know what you think!